So I have this habit where once a product is about to finish and only few drops are left in it, I keep it and then take a new product. Sometimes I do that with the purpose of posting reviews, so I will have a swatch to show. And then I never end up doing it. So the almost emptied product sits on my shelf for ages. Other times, due to season change, I have to stop using a product. And then it is left half empty. So the beginning of this year, I made it a point to #ShopMyStash and use up products which were already used up more than 70%. So I can throw them away for good. Apparently, there were a lot of such products. Now since the first quarter of 2019 is over, am almost done with them. 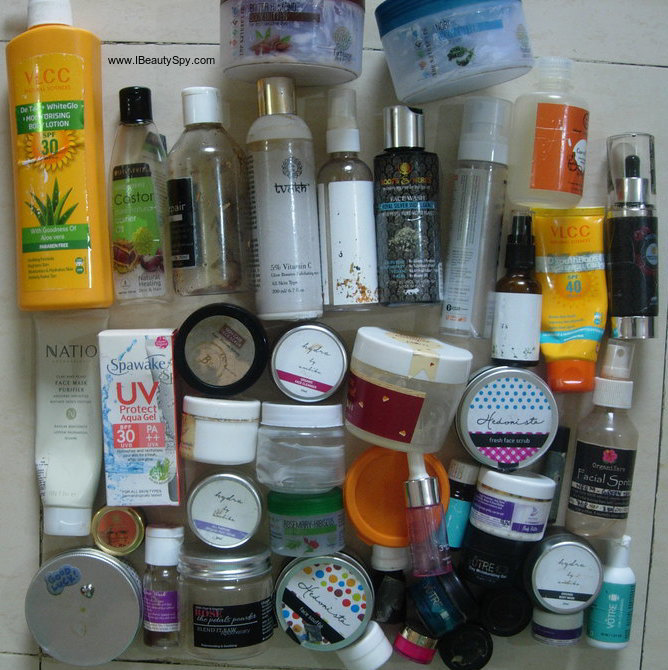 So am doing a decluttering and empties post for those products. These might look like a lot to empty in 3 months, but they were all already 70% emptied. Am going to divide this Decluttering post into 3 parts to keep each one short. 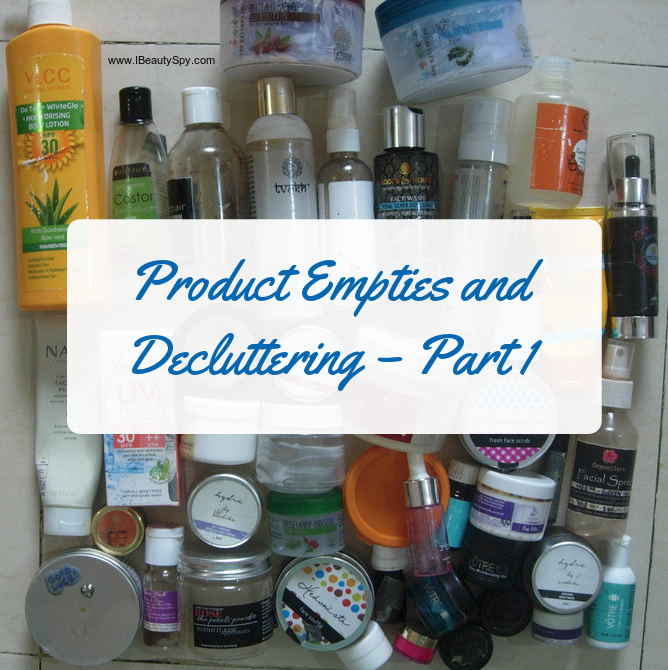 Let’s begin part 1 of Products Decluttering. Absolute dud product. Never pick this up. The fragrance is irritating. Does nothing for detan. Lotus Herbals has a similar one which is far better than this. I got these body butters from The Nature’s Co when they were having 50% discount. It is a huge tub and most economical body butter when you get on 50% offer. The Bitter Almond variant is really good. Thick and deep nourishing. This is not as nourishing as the Bitter Almond variant. But still thick and emollient compared to other body butters in the market. I liked both these variants. I got this in winters. To be mixed with hair oil and body butter. It is really good for treating dryness. I got one for my dad too before. And he liked it very much. But it cannot be used alone as its too thick. Needs to be mixed with something else. This hair oil is a concotion of coconut, almond, flaxseed, linseed, olive, argan and neem oils. Contains herbs of ginger, lemon, fenugreek, black onion seed, lemongrass, neem, sage, rosemary, vitamins C, D, E and growth-inducing essential oils. This really works for hair growth. It also conditions hair well. Would definitely recommend this hair oil. An okay product. Nothing great. Not bad either. A very nice face wash for oily-combination skin types. Deep cleanses skin. And has a sweet scent of cardamom. Would recommend this one. Check full review here. I got two of this in two subscription boxes. It is an excellent face wash for clear and brightened skin. Controls oil too. I used this only 2-3 times a week as its an expensive face wash and I didn’t want it to get over. It feels like the spa kind of face washes which they use in parlours to give instant brightness. I picked this up randomly during a sale and it turned out to be absolutely amazing. So refreshing. So hydrating. And loaded with antioxidants. Will recommend definitely. Have you seen a carrot oil in any other brand? This is so soothing and nourishing on the skin. Treats inflammation and itchy skin. And gives a healthy glow. Full review here. An excellent organic moisturizer for healthy and glowing skin. Loved this so much. Full review here. An okayish product. If you run out of sunscreens and have to get something from the nearest supermarket in a hurry, you can try this. But there are far better sunscreens online. Illuminates your skin like a moon. Would definitely recommend. Expensive, but quantity is a lot. I had got this a long time back in some offer. Had to finish it off. This is a Australian clay plant mask especially for dry skin. It brightened my skin every time I use it. The quality is really good. There are very less sunscreens that I like. But this one turned out to be really good. It has a light, runny texture which gets absorbed quickly. It is not transparent like a gel, but feels light as a gel. And feels slightly cooling on the skin. Doesn’t leave any white cast. It has SPF 30 UVB and PA ++ UVA. Contains sea minerals.